By bringing in Doug Meacham and Sonnie Cumbie to run TCU's offense, Gary Patterson turned the Horned Frogs into title contenders. FORT WORTH, Texas — According to the box score of the 2010 junior college national title game between Navarro and Butler Community College, the temperature at kickoff in Pittsburg, Kan., was 25 degrees. According to the two future co-workers who met there that day while scouting Butler receiver Marcus Kennard, it was much colder. As conference rivals, the pair couldn’t share much information. But the coaches could commiserate through their chattering teeth. Cumbie, a former quarterback for Mike Leach in Lubbock, and Meacham, a former Oklahoma State offensive lineman who was an early adopter of Leach and Hal Mumme’s Air Raid offense, had plenty of friends in common. Cumbie would wind up signing Kennard, but the bigger prize that day was the start of a friendship that four years later would help turn another Big 12 school into a national title contender. ​When TCU coach Gary Patterson contacted Meacham and Cumbie after a 4–8 season in 2013, the two assistants knew Patterson planned a big change from the methodical, stay-out-of-the-defense’s-way offense Patterson favored for most of his career. Meacham had spent ’13 running an up-tempo offense at Houston. Cumbie was a co-offensive coordinator at Texas Tech, but everyone knew Red Raiders coach Kliff Kingsbury controlled his own version of the Air Raid, which Kingsbury and Cumbie each ran for Leach as Texas Tech quarterbacks. It did. Patterson, after his most frustrating season as a head coach, realized he needed to make major changes. 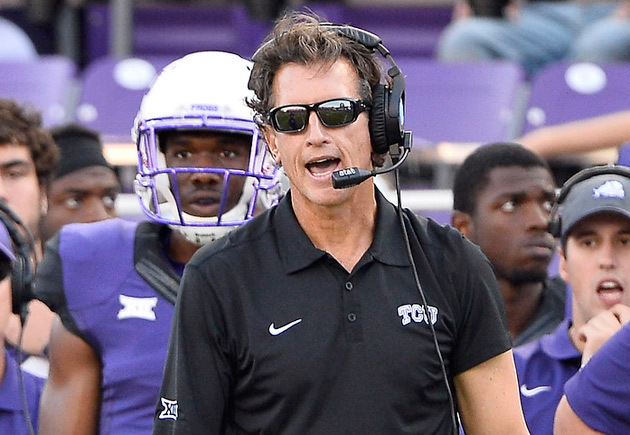 Not only did his offense struggle to keep pace on the scoreboard with the rapid-fire offenses in the Big 12, it also couldn’t give the Horned Frogs defense an adequate look at the speed it would face in a game. After Meacham and Cumbie arrived, the offense and the defense got better. An already excellent Horned Frogs defense went from allowing 4.8 yards a play in 2013 to 4.7 in ’14, second best in the Big 12. Meanwhile, TCU’s record improved to 12–1. The Horned Frogs just missed the College Football Playoff and finished the season by pasting Ole Miss in the Peach Bowl. For that, TCU can thank Patterson, the two coordinators he hired and 10 personnel. The numbering system for personnel packages works like this. The first digit is the number of backs on the field. The second digit is the number of tight ends. To find the number of receivers, add the first two digits to six (one quarterback and five offensive linemen) and subtract that sum from 11. The preferred personnel grouping in the Big 12 is 10: one back, zero tight ends, four receivers. TCU’s old offense was designed for 11 or 21. It also huddled regularly. TCU’s scout team offense would simulate up-tempo schemes for the defense, but when the Horned Frogs went good-on-good—when they practiced against the type of players they’d see on Saturday—the defense rarely saw anything that looked like the upcoming opponent. That’s why Patterson doesn’t refer to his hiring of Meacham and Cumbie as a change of offense. “It’s truly a change of philosophy,” Patterson said at Big 12 media days in July 2014. He compared the old philosophy of beating teams 17–13 to drinking only water while training. What might happen, he asked, if the Horned Frogs began drinking Gatorade? Well, 12–1 happened. But what Meacham and Cumbie didn’t realize until they started working with the Horned Frogs was that they already had the personnel they needed. “You think it’s going to be 15 tight ends and five fullbacks,” Meacham says. Instead, players who fit awkwardly into the old offense seemed designed specifically for the new one. Meacham and Cumbie had inherited elite speed at receiver in Kolby Listenbee and an all-purpose pass-catcher in Josh Doctson. They had backs who could exploit a spread-out defense. Most importantly, they had Trevone Boykin, who had played tailback, receiver and quarterback since coming to college, in contention to be the triggerman. Cumbie came to the Air Raid as a Texas Tech quarterback. He started as a senior in 2004, throwing for 4,742 yards. Meacham spent his college years blocking for Barry Sanders, Thurman Thomas and future boss Mike Gundy. (Though he’s currently built like an NBA shooting guard, Meacham was once a power conference offensive lineman. There are pictures to prove this.) Meacham found the Air Raid in ’92 as an assistant at Georgia Military College, a juco program in Milledgeville, Ga. The players at GMC were only supposed to hang around for two seasons, but they didn’t always make it that long. GMC coaches needed an offense the players could master quickly. They found it during a visit to Valdosta State, where head coach Mumme and offensive coordinator Leach were tormenting defenses with a deceptively simple, pass-heavy offense. Mumme’s Blazers had brought in the Bulldogs for a joint practice similar to the ones NFL teams combine to hold during training camp. “It was a practice and a scrimmage which broke out into a massive fight,” Meacham says. But once the dust cleared, Meacham knew he’d found an offense he could teach quickly to players who might only last a season. “It was just the simplicity I enjoyed,” Meacham says. Indeed. 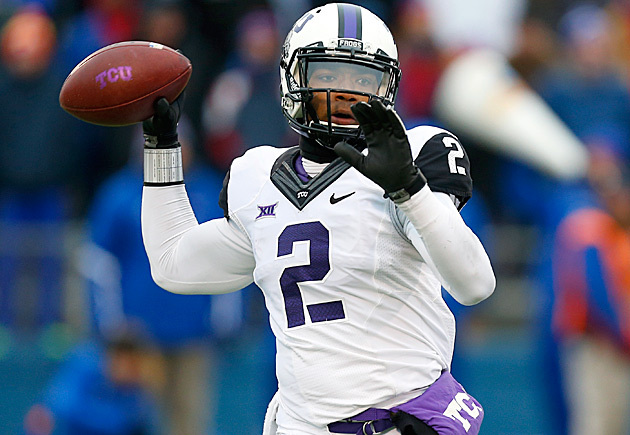 Boykin’s 2014 numbers compare favorably to Marcus Mariota’s ’13 numbers. Meanwhile, TCU went from having a barely functional offense to one that produces points and helps TCU’s defense prepare for what it usually will see on Saturdays. “When we used to do offense versus defense, we used to have a little break,” defensive end Mike Tuaua says. “When coach Meacham and them came, practices were horrible.” But games were easier, which is part of the reason Patterson altered a philosophy that had served him well for a long time. “For him to have the foresight and the belief in it and let us do it, that’s a real head coach,” Meacham says. What it took was Patterson scrapping his old offensive philosophy and trusting Meacham and Cumbie to build a new one. After that, the Horned Frogs were ready to compete for the titles that matter. I’ve had an issue of late with a relatively new neighbor who loves to park his car on the street in front of my house even though he has an open space in his driveway. His reasoning: It’s a public street, and it’s shady. This wouldn’t be as much of a thing if we lived downtown where parking is scarce. This is a subdivision. Aside from the OPEN SPACE IN HIS OWN DRIVEWAY, he also has the entirety of the curb in front of his house. But no, he likes to park in front of my house. Had he asked my blessing, I’d probably be fine with him parking there occasionally. But he didn’t. He knows I can’t legally have him towed, so he keeps parking there. He does this because he is rude. Here is a list of the top—or possibly bottom—five rude acts. 1. Attempting to enter an elevator before the people in the elevator have exited. This is the surest sign that a person was actually raised by wolves. Hot seat rankings: Which coaches are feeling the heat in the 2015 season? 2. Bad tipping for good service. The gratuity system only works if we honor the social contract that dictates we tip well for good service and poorly for bad service. This really is how everything should work. Do your job very well, make more money. Do your job poorly, make almost no money. Unfortunately, some people can’t hold up their end of the bargain. It’s fine to leave a few measly bucks if the service was terrible. But if the service was good and you simply throw down some spare change, you’re removing that server’s incentive to do a good job for the next party at the table. For this, you should be hurled into the sun. The person on the other end can hear you just fine if you speak at a normal volume. The rest of us, meanwhile, will go merrily about our day without hearing how many beers you plan to cruuuuuuuuush once you get to the bar tonight. 4. Writing a check in the express lane at the grocery store. I realize there are only nine people left in the United States who write checks at the grocery store. Unfortunately, I’m usually behind one of them in the express lane holding my one gallon of milk while they verrrrrrrrrrry sloooooooooooowly pay for their 23 items. 5. Backing into a parking spot. I watched a man make three attempts to back into a shopping center space Sunday. Even after he finally seemed satisfied, he was crooked. He wasted more time on the front end than he saved on the back end. • The parking lot posts signs requiring back-in parking. • You are attending a sporting event or concert, and 90,000 people will be trying to leave at once. • You are robbing the place. If your situation doesn’t match one of the previous three scenarios, just park like everyone else. ​Meacham followed college roommate Robert Nunn to Nunn’s hometown of Apache, Okla., to work on the grain elevator. The former Cowboys players had taken graduate assistant jobs at Northeastern Oklahoma, but they had some time to kill between receiving their degrees and reporting for their first coaching gigs. They both chose the correct career. You just read about Meacham. Nunn, meanwhile, is the defensive line coach for the New York Giants. 2. The saddest part of the preseason is when the injury reports begin to roll in. Players punish themselves in the off-season to prepare and then have all or part of their seasons ripped away because of bad luck. This past week was especially tough for a few programs. On Tuesday, Tennessee offensive guard Marcus Jackson injured his arm and could be lost for the season. Volunteers coach Butch Jones said the earliest Jackson might come back is a bowl game, but Jones didn’t seem optimistic. That’s a blow for the young and talented Vols, who have seriously upgraded their talent in recent years but still need to add depth. Arkansas announced Sunday that tailback Jonathan Williams would miss “an extended period of time” because of a foot injury suffered in a scrimmage on Saturday. Williams led the Razorbacks in rushing last year with 1,190 yards. Alex Collins, who ran for 1,100 yards in 2014, should be able to pick up some of the slack. Kody Walker, who received the bulk of the carries in the spring as coaches rested Williams and Collins, should also see his workload increase. 3. Quarterback Vernon Adams is finally an Eastern Washington graduate and an Oregon graduate student after passing a math test Thursday afternoon to close his undergraduate career. On Friday, Adams made his belated arrival to Oregon’s preseason camp. The original plan was for Adams to graduate from Eastern Washington and spend the summer working out with his new teammates before starting practice on time with the Ducks. That went by the wayside when Adams had to retake a math class. Now he’ll be behind as he tries to beat out fourth-year junior Jeff Lockie to replace Marcus Mariota. This is the part where we remind everyone that if a coaching staff brings in a transfer quarterback late, it means the coaches aren’t necessarily comfortable with the quarterbacks on their roster. This is also the part where we remind everyone that Alabama brought in Jake Coker from Florida State last summer only to have Blake Sims—who had been in Tuscaloosa all along—win the job and lead the Crimson Tide to an SEC title and the College Football Playoff. What happens next in Eugene will depend on Lockie and Adams. As a recruit, Town first committed to Alabama but decommitted after the Crimson Tide hired former USC coach Lane Kiffin to run the offense. That left an open spot at Alabama that current Tide freshman Blake Barnett filled after decomitting from Notre Dame. Notre Dame filled that spot with Brandon Wimbush, who had been committed to Penn State. That caused Penn State to offer Tommy Stevens, who decommitted from Indiana to go to the Nittany Lions. That caused Indiana to offer Austin King, who decommited from NC State to become a Hoosier. That caused NC State to offer Jakobi Meyers, who decommited from Kent State to commit to the Wolfpack. That caused Kent State to offer Mylik Mitchell, who had not committed anywhere at the time. Now Town will choose a new school, perhaps starting another chain reaction. 5. Cordell Broadus, the son of Snoop Dogg, left the UCLA football team shortly into his first preseason practice. Broadus, who starred at receiver at Bishop Gorman High in Las Vegas, left on good terms, according to a UCLA release. “Cordell informed me yesterday that he has decided to pursue other passions in his life - in particular his love of film through his company Film School Productions,” UCLA coach Jim Mora said in the release. That statement officially makes this the most Los Angeles departure from a team in college football history. Only in L.A. would a departing player convince his coach to plug the player’s production company on the way out. Maybe Broadus was feeling a little pressure. After all, Uncle Ice Cube’s kid is about to become a huge movie star thanks to Straight Outta Compton. 6. Virtual reality is all the rage in college football. Programs are using the technology to train quarterbacks and help recruit new players. But rather than sign up for one of the virtual reality services, Tennessee video coordinator Joe Harrington built his own system. Read the excellent story from Patrick Brown of the Chattanooga Times Free Press. 7. Wake Forest wide receiver Cortez Lewis is a man of many handshakes. 8. Notre Dame coach Brian Kelly asked walk-on back Josh Anderson to model for his teammates the green uniforms the Fighting Irish will wear at Boston College. When Anderson got in front of the team, Kelly had a surprise for Anderson—a scholarship. 9. It was a big week for new uniform reveals. You’ve seen Notre Dame’s Shamrock Series unis, but here are a few more. 10. Seemingly every team in the country posted a long snapper trick shot video this week, but the most amazing came from Southern Miss. Fifth-year senior Lance Schuffert, collect your gold medal. If you read the intro to “A random ranking,” you know what's eating at me. I have paid John Currence several compliments in this space, but none soar higher than this one: I have no idea what kind of sauces Currence offers at Lamar Lounge. 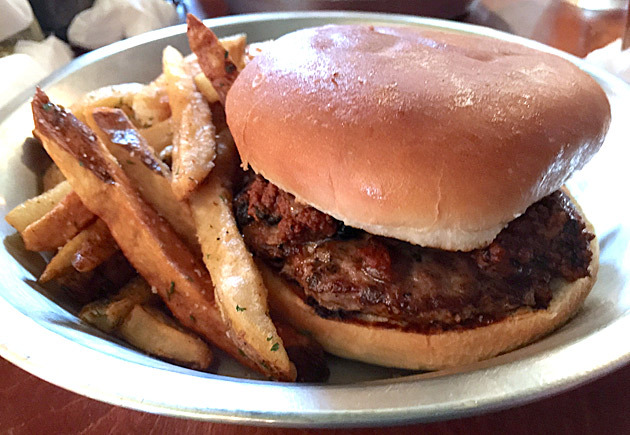 I’m fairly certain the whole-hog barbecue joint the James Beard Award-winning chef added to his Oxford, Miss., restaurant empire in 2012 does serve sauce. I seem to remember sauce on the table, but I can’t be sure because I don’t remember touching it. The best barbecue requires little or no sauce. Cook it properly, and no one mentions condiments. 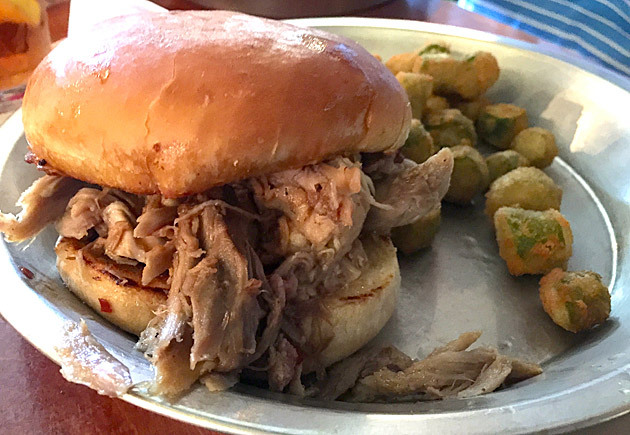 At Lamar Lounge, my pulled pork sandwich and most of my fried okra were devoured before I even gave a passing thought to accompaniment. Currence advertises Lamar Lounge as the only whole-hog barbecue in the state of Mississippi. I have no way of verifying that claim. I know they used to serve pig face and call it Snoop at Petty’s BBQ in Starkville, but I don’t recall the entirety of the hog being smoked. What I can verify is that Currence and his pit team have taken a method favored by the best barbecue cooks in the Carolinas and brought it to the college town that they’ve helped turn into a foodie Mecca. The sandwich I had a few weeks ago was so delicious that I didn’t take the best notes. Some of this review has been cobbled together through forensic evidence. For instance, a photo of my sandwich reveals a fleck of red pepper. That suggests the cooks at Lamar Lounge used a peppery vinegar bath similar to the ones popular in eastern North Carolina (think Skylight Inn in Ayden) or the Pee Dee region of South Carolina (think Scott’s BBQ in Hemingway). This officially can be considered sauce, but instead of masking the deficiencies of the meat—as most barbecue sauces do—this kind enhances the positives. One of the fringe benefits of serving whole hog barbecue is the ability to serve pork skins as an appetizer. The pork rinds you’ve had from the gas station probably tasted great. Now imagine them fresh and free of preservatives. Get the pork skins at Lamar Lounge, and they will pave the way for the juicy meat inside that sandwich. While the pulled pork may be the most labor-intensive item on the menu, it has competition as a sandwich filling. The list of 4-ounce “Econo Burgers” includes a chili burger that tastes like the ones at The Varsity in Atlanta if the chili at The Varsity was—what’s the word?—good. The intestinal gymnastics produced by the chili are part of the charm at The Varsity, but fortunately the crew at Lamar Lounge doesn’t want to turn you into a ticking time bomb. Instead, high-quality beef rests beneath a blanket of rich, meaty, slightly spicy chili. Fortunately, I had already eaten a pulled pork sandwich. Otherwise, I might have ordered five more chili burgers. Either way, I never would have given a thought to condiments.